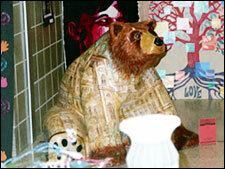 “Townie” was created by a team of students under the direction of art teacher Debra Benfield and BASD retired art art teacher Sandra Wood. After researching the history of Boyertown, the students and teachers selected the images to represent the town’s history. You’ll note along the base of the bear there are railroad tracks and images of coal miners to represent the importance of the mines which ran along under the town and the transportation system vital to the mines’ success. You’ll note tributes to General Carl Spaatz, one of Boyertown’s most famous and decorated military heroes and the devastating Opera House Fire, as well as indications that Boyertown retains its historical presence through the continued existence of some of its most prominent buildings: Twin Turrets Inn; St. John’s Lutheran Church; Good Shepherd Church; and the Odd Fellows’ Hall, home of one the students’ favorite haunts, The Grill Shop. Trees and antique cars are included on “Townie” to represent both the rural nature of Boyertown and also acknowledge its debt to the industrial efforts critical to its earlier success found in the Casket Company, the Body Works, and the Eastern Foundry, for example. The town’s strong sense of patriotism is represented in the inclusion of the flag on “Townie’s” back. Students who worked many hours together on “Townie” learned a lot about the town’s history and about the rewards and challenges of teamwork inherent in a project involving many creative individuals. 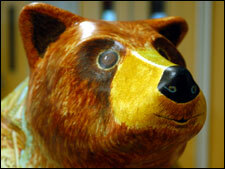 “Townie” remains the favorite Bear Fever bear in the collection for many people. The student design team included Josie Moore, Chris Harley, Jenn Yates, Jess Kemp, Amanda Drewicz, Christine Quinlin, Kristin Quigley, Jarod Strouse. The primary student painters were Jess Kemp and Amanda Drewicz. 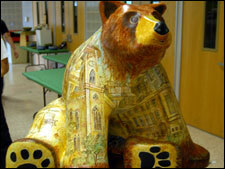 The images displayed on the bear include Dr. Borneman’s House, Good Shepherd UCC, the Larson house, Boyertown Senior High School, Cannon Hill, the Grill Shop, Lincoln Elementary School, St. John’s Lutheran Church, the Boyertown Inn, Boyer’s Store, Fairview Cemetery, Bause’s Drug Store, Boyertown Museum of Historic Vehicles, Twin Turrets, a child’s Department Store, the train station, General Spaatz Memorial, the Boyer home, National Bank of Boyertown (National Penn Bank), Washington Elementary School, the opera house, Boyertown trolley, railroad crossing on East Philadelphia Avenue, Taylor Backes and Tibitu Glassblowing Studio, former Boyertown Post Office, Keystone Fire Company, the casket company, the mines under Boyertown, Central House, former Tulip Bulb, and Borough Hall. Sandra Lee Wood taught art at Boyertown Elementary School for 40 years. For 15 of those years she doubled as Supervisor of Art for the district. She was the recipient of the Pennsylvania Art Education Association 1990 Outstanding Art Educator Award. Since 1993 she has served on the association’s board currently as Retired Division Director. Since her retirement from public school teaching in June 2000, she has given up her passion to perform in the theatre to pursue refining her watercolor painting. She presents workshops to teachers in the tri-state area for Binney and Smith, Inc., the makers of Crayola products, and has accepted an adjunct teaching position for Kutztown University. Debra Benfield has been an art teacher in the Boyertown School District for 19 years. During her tenure she has taught design classes, painting, drawing, computer graphics, sculpture, weaving, and multimedia design. The first 14 years of her teaching experience, she shared her time between the elementary school and the high school. She mentored under Sandy Wood at the elementary school. Debbie’s qualifications include the supervision of an after-school “Open Art Studio” for interested art students to obtain more studio time. She coordinates an annual “Arts” Expo” that collaborates the efforts of all of the arts at Boyertown Senior High School: visual, performing, vocal, instrumental, and culinary. Each year she directs students in a community service project including making flag baskets for a Red Cross fundraiser following the 9/11 incident, Easter baskets for children in a homeless shelter in Reading, PA, and most recently renovating a courtyard at the high school into an open classroom.